For a few years now, I’ve been fascinated by long, long walks. Pilgrimages. Solo treks across countries, across continents. 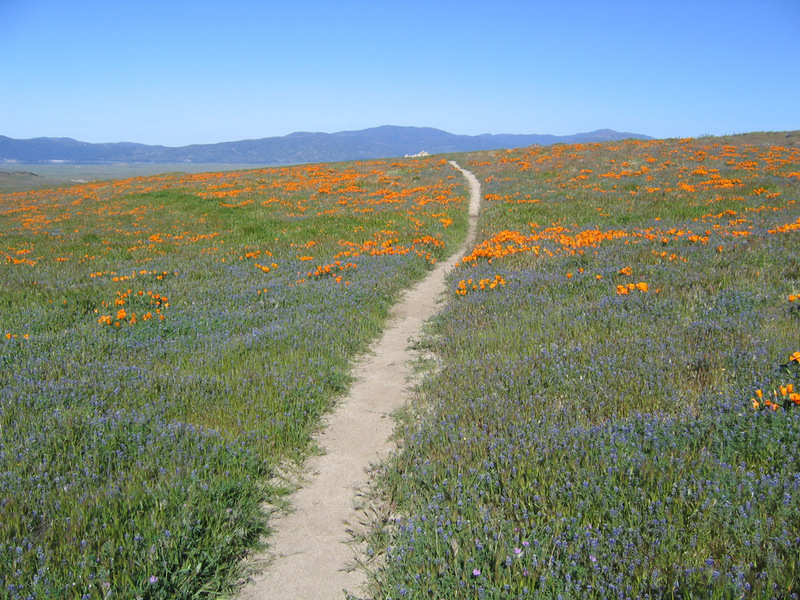 From the Pennine Way to the Pacific Crest Trail (recently made famous by the film Wild) as well as less officially designated trails, there are so many journeys to make. I like the idea of wandering, but having a route and destination at least vaguely in mind is a part of it. Being free to point your nose to the trail and walk, knowing that’s your task and your goal. Otherwise, I have a tendency to merely drift. Today I found out about The World Walk: a guy my age who is spending five years walking across all five continents. He’s pulling his stuff in a handcart. I read about Cheryl Strayed’s self-help trek on the Pacific Crest Trail, but also Peace Pilgrim‘s 25,000 miles across America without baggage or supplies. Walking has power, and walking far, travelling those immense distances under your own power, being just that small dot on one huge map… I want to do that. I remember reading an article or essay or something, let’s call it a short travelogue, of someone walking the Camino de Santiago pilgrimage. I’m not a Christian, I’m not any religion, just can’t deal with being spiritually dictated to, but the idea seemed to take hold that I should become a pilgrim. That spiritual element is important, I think. Or maybe the idea of walking for penance. Retreat. The rhythm of walking generates a kind of rhythm of thinking, and the passage through a landscape echoes or stimulates the passage through a series of thoughts. This creates an odd consonance between internal and external passage, one that suggests that the mind is also a landscape of sorts and that walking is one way to traverse it. A new thought often seems like a feature of the landscape that was there all along, as though thinking were traveling rather than making. I want to walk in order to think clearly, not in the neurotic circles of sedentary contemplation, but with the freedom lent by an ever-changing scene. To experience new things constantly, while maintaining a constant rhythm of steps, of days. To get strong and overcome some painful misery that actually counts. Walking as meditation and pilgrimage and self-discipline, as well as good old-fashioned means of transport to see the world. It’s 1am and I’m absolutely convinced right now that I should go on some walk. Not literally right now, it’s dark outside, but I’ve wanted and talked about some kind of backpack treck adventure for years now, without it moving any closer to reality. So this is me realising that if I don’t start thinking real world, I’ll never get to do this, and I’ll die unfulfilled and embittered by regrets. I’d like to walk across Europe, eventually.